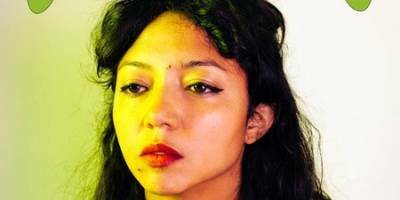 Shana Cleveland has been beguiling listeners for years in her role as the superlative frontwoman for elastic surf rockers La Luz. Now Cleveland is evolving her sound on the new solo full-length Night of the Worm Moon, a serene album that flows like a warm current while simultaneously wresting open a portal to another dimension. Cleveland dreamt up this premise while living in Los Angeles, a city where–as deftly explored on La Luz's recent Floating Features–reality and fantasy casually co-exist. One particularly evocative scene laid the groundwork for Night of the Worm Moon's psychedelic undercurrents. As Cleveland tells it, "Shortly after I moved to Los Angeles I went to a hip hotel to watch a poolside screening of a documentary about a local alien-worshiping cult. Out front celebrities were getting out of the backs of cars and rushing past autograph hounds into some roped-off room where a secret dinner was about to commence. In the lobby a woman was being paid to exist inside a glass box. [Then] a car dressed as a spaceship pulled up in front to release 30 white doves into the sky above Sunset Boulevard." Appropriately enough, Night of the Worm Moon was recorded during a rare cosmic occurrence: 2017's solar eclipse. "We took a break from recording during [the] totality and looked at the sun's image through a piece of cardboard projecting onto a garbage can," Cleveland says. "When we came back inside the studio was covered in dozens of tiny crescent suns, refracted from a mirrored disco ball that [engineer Johnny Goss] had hanging in a window." Night of the Worm Moon occupies a vibrant kind of headspace. UFO sightings, insect carcasses, and twilight dimensions are all grist for Cleveland's restless creativity, and they and other inspirations collide beautifully on the album's 10 kaleidoscopic tracks–a spacebound transmission from America's weirdo frontier.